The belt conveyor feeds the plate to the welding station 90° located. From the roll the separator is fed into a rotating system able to bend it in the middle before cutting. The adjustment of the desired length is very quick and it is made by means of one speed variator. After the enveloping operation the second feeder provides the no-enveloped plate (negative or positive according the selected program) over the enveloped one until the reaching of the selected number of combined plates. An additional feeder, if it is necessary, feeds the odd plate over the formed group. The all stacking operations are controlled by a microprocessor where all programs can be stored. One automatic mechanism transfers the groups from horizontal to vertical position and stores them. The speed is easy adjustable by means of moto-variator controlled by an inverter. Machine capacity:…………….90 enveloped plates per minute. 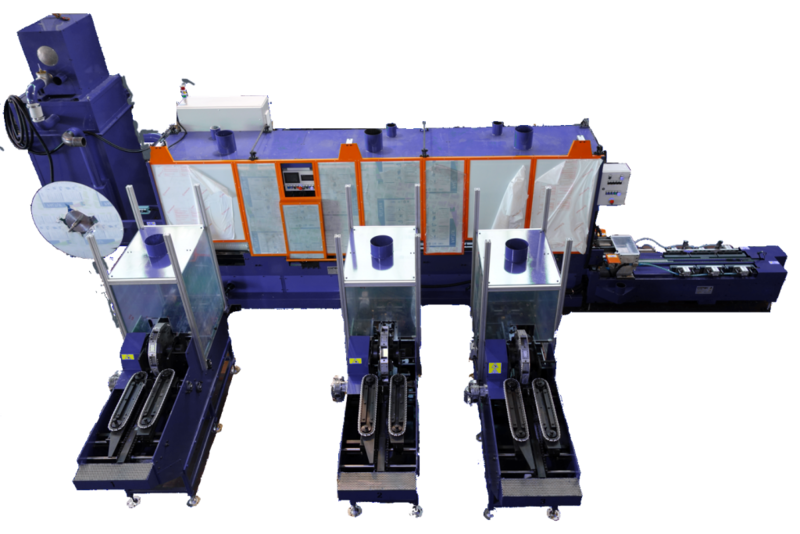 Machine capacity: …………..130 enveloped plates per minute. Machine capacity: …………….200 enveloped plates per minute.